Modern wind technology is available for a range of sites: low and high wind speeds and desert and arctic climates can be accomodated. European wind farms operate with high availability (97 per cent) and are generally well integrated with the environment and accepted by the public. At the start of the millennium, an ever increasing (in fact mathematically exponential) growth in turbine size with time had been documented by manufacturers, such as Siemens Wind Power (earlier Bonus AS), and was a general industry trend. In the past three or four years, although interest remains in yet larger turbines for the offshore market, there has been a levelling of turbine size at the centre of the main, land-based market and a focus on increased volume supply in the 1.5 to 3 MW range. The past exponential growth of turbine size was driven by a number of factors. The early small sizes, around 20-60 kW, were very clearly not optimum for system economics. Small wind turbines remain much more expensive per kW installed than large ones, especially if the prime function is to produce grid quality electricity. This is partly because towers need to be higher in proportion to diameter to clear obstacles to wind flow and escape the worst conditions of turbulence and wind shear near the surface of the earth. But it is primarily because controls, electrical connection to grid and maintenance are a much higher proportion of the capital value of the system. Also, utilities have been used to power in much larger unit capacities than the small wind turbines, or even wind farm systems of the 1980s, could provide. When wind turbines of a few hundreds of kW became available, these were more cost-effective than the earlier smaller units, being at a size where the worst economic problems of very small turbines were avoided. However, all the systems that larger wind turbines would require were also needed and the larger size was the most cost effective. It also became apparent that better land utilisation could often be realised with larger wind turbine units, and larger unit sizes were also generally favourable for maintenance cost per kW installed. All these factors, the psychology of ‘bigger is better’ as a competitive element in manufacturers' marketing, and a focus of public research funding programmes on developing larger turbines contributed to the growth of unit size through the 1990s. 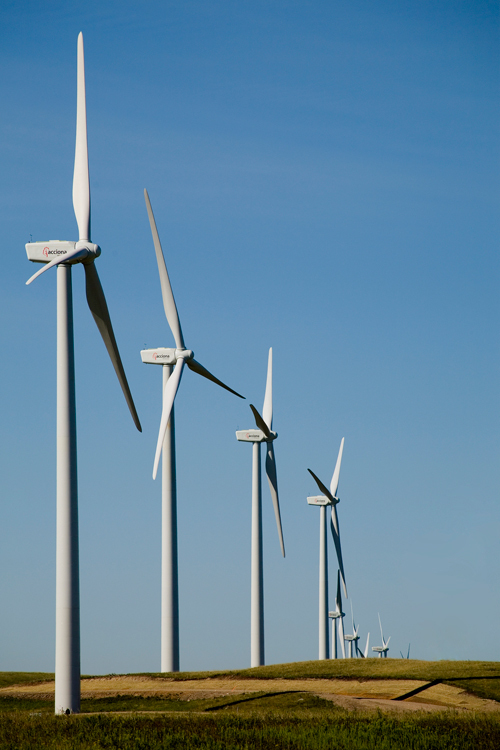 Land-based supply is now dominated by turbines in the 1.5 and 2 MW range. However, a recent resurgence in the market for turbines around 800 kW size is interesting and it remains unclear, for land-based projects, what objectively is the most cost-effective size of wind turbine. The key factor in maintaining design development into the multi-megawatt range has been the development of an offshore market. For offshore applications, optimum overall economics, even at higher cost per kW in the units themselves, requires larger turbine units to limit the proportionally higher costs of infrastructure (foundations, electricity collection and sub-sea transmission) and lower the number of units to access and maintain per kW of installed capacity. 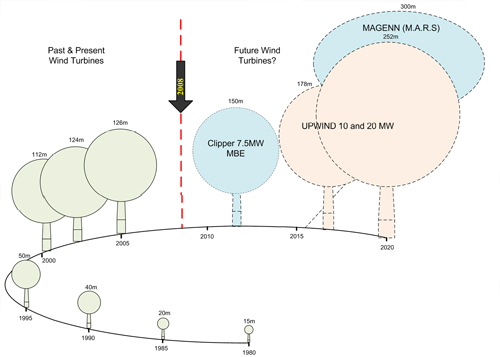 Figure 3.10 summarises the history of sizes of leading commercial wind turbines up to the present (2008) and illustrates a few concepts for the largest turbines of the near future. The future challenges in extending the conventional three-bladed concept to size ranges above 5 MW are considerable, and are probably as much economic as engineering issues. Repower, exploiting reserve capacity in design margins, has up-rated its 5 MW wind turbine to 6 MW and BARD Engineering has announced a similar up-rating of its 5 MW design to 6 MW and later 7 MW. Clipper Windpower has announced a 7.5 MW prototype to be purchased by the UK Crown Estates (an unprecedented type of investment for them), with no specific timeline for development, but suggestions of production by around 2012. The interest in yet larger wind turbines, especially for offshore markets, is reflected in the UPWIND project. This major project of the EU 6 Framework Programme addresses a wide range of wind energy issues, including up-scaling, by evaluating the technical and economic issues in developing unit wind turbines of 10 and 20 MW capacity. The Magenn airborne wind energy concept is one of a number of speculative new concepts for large capacity wind energy systems that is reviewed later in the chapter (Future Innovations).